10 square per inch graph paper with a 45° twist. So you've picked up your first calligraphy pen. Before you start trying to learn to write a specific calligraphic script, get comfortable with the pen. I'm going to start this post by discussing how and why using these pens is different from modern round-tipped pens, and then suggest some practice exercises that will help prepare you for calligraphic scripts. keeping the writing edge of the nib flat on the paper. moving the pen from your shoulder and elbow, not your wrist and fingers. keeping the angle of the nib consistent. When using a fountain, dip or quill calligraphy pen, the ink travels down the nib via a slit (or slits) to reach the writing edge. 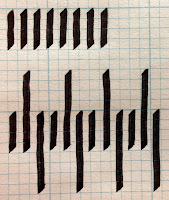 In order to leave lines with a uniform width and crisp edges at the beginning and end of the stroke, the flat tip must remain parallel to the surface of the paper while writing. If one corner is pressed into the page and the other lifted, you can have problems with the ink flow and line consistency. If you normally write by moving your pen with your fingers and wrist, the angle and twist of the pen on the page changes within each stroke. With a round-tipped pen like a ballpoint, this doesn't matter. With the chisel tip on a calligraphy pen, it does. Try to make your strokes through movement of your elbow and shoulder, keeping your fingers and wrist fixed holding the pen at the proper angle. If you are finding it difficult to remember to do this, practice larger; longer strokes cannot be accomplished with just finger and wrist movement. One other thing that may help is the angle of your writing surface. As I've written before, I usually work at a very step angle, which allows my forearm to hang below the writing area. I feel this allows me to draw my vertical strokes much more consistently. It also allows me to get closer to my work. Experiment with this when you practice to see if it helps you. In addition to learning to keep the writing edge of the nib flat on the paper, you need to learn how to keep the angle of the nib consistent. It's this angle that creates the beautiful combination of thick and thin lines calligraphy is known for. Scripts are written with the nib angled anywhere from 0° (horizontally) to 50° (in counterclockwise twist) or more. 45° is a great angle to start with. Ink flow from a calligraphy nib is very different from ballpoint or felt-tip pens. As you practice, focus on making sure that the start & end of each stroke has crisp, square corners. This can take more work and focus when using a dip pen, but even cartridge based fountain pens take some getting used to. Obviously, if you are practicing with a felt-tip calligraphy pen, this will be easier. Make sure to practice with dip and cartridge pens before using them. Try various methods to insure the start of the stroke is inked across the entire width of the nib: a little extra pressure at first; a little wiggle before the stroke starts; or perhaps getting the nib primed on some scrap paper moments earlier. Especially when using a dip pen, remember that the ink can dry up in the nib as you pause to consider what you are doing next. If you are using a cartridge pen, make sure it is assembled correctly, clean, and you are using the appropriate ink. Some brands of pen flow ink faster than others as well. With a dip pen: make sure it's not too full of ink; if it has an adjustable reservoir, try sliding it back away from the writing tip a small amount; make sure your ink is mixed well, or try a different brand of ink; if you've been using it for a while, clean it out and dry it. 90° and draw five strokes like so. Pick a fixed angle to practice, I recommend 45° to start. Use guidelines that are between 3-5 nib widths apart. 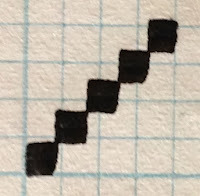 If you are using graph paper, draw out nib width markings to find out how many graph squares high that would be. For this 2.3 mm nib, 5 nib widths is just over 4 squares high. 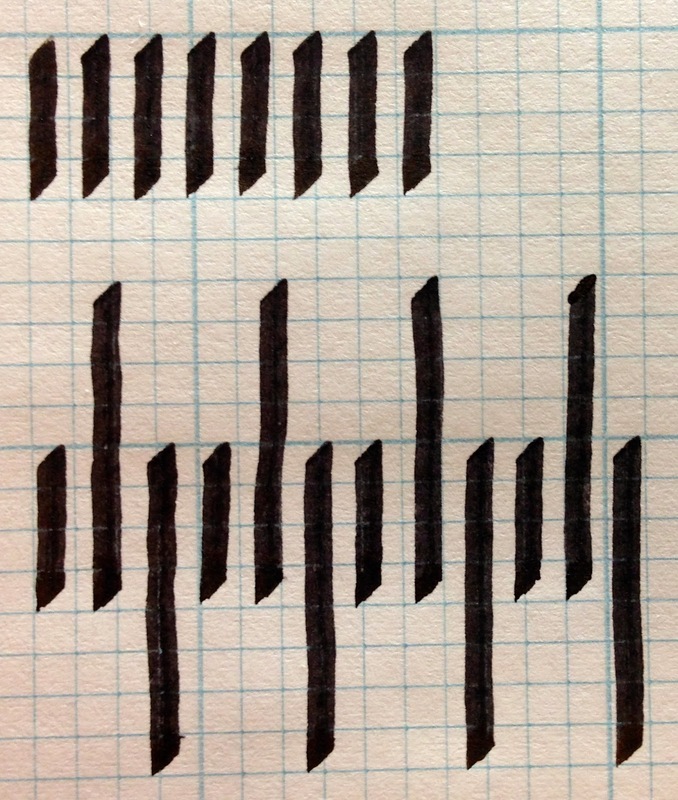 Warning: while graph paper is convenient and quick to practice on, the permanent guidelines can start to make you feel bad about the quality of your vertical strokes. Try practicing on plain paper with pencil guidelines. Erase them after the ink is dry to get a better sense of how your strokes look on their own. Loop de loops! These let you learn how the pen feels traveling in different directions. While making them, work on keeping the writing edge flat on the paper. They also help you get used to using your whole arm to write. Note that some nibs may not want to work well when pushed up the paper. They may skitter, catch, flick ink, or leave an inconsistent line; this is normal and something to learn about your particular pen. Get a feel for the pen, don't be concerned with trying to make each loop the same size. Zigzags. Work on keeping the strokes as thick and thin as the nib will let you. Try to keep each stroke 90° from the last. Try to make the corners just barely touch the guidelines. When you've done the first, you can go back and try to interlace a second zigzag. Make sure you have space to move your arm for this exercise. Twisting the paper or working on an angled surface may help. Vertical strokes. These are especially important to practice if you want to learn one of the gothic scripts. Try to make the whitespace between each stroke the same width as the strokes themselves. Make sure that the tips of each stroke begin and end just touching the guidelines. If you want to increase the challenge, work taller. You can alternate going above and below the original guideline and start to practice the same strokes used to make ascenders and descenders. even on the extended diamonds. gothic. If you are using graph paper, practice drawing a diamond such that each point is touching a guideline. Once you have these down, practice diamonds that are extended in width, while still having the left and right points on the guideline. You can then move on to diamonds with a flourish. Even with this curved stroke on the left or right side, note how the left and right points are still right on the guidelines. Verticals with tails. Vertical lines with tails at the start and end. Practice with the tails on both sides: Tails on the upper left and lower right are usually used in making lowercase letters; tails on the upper right and lower left are often used as flourishes on ascenders or descenders. When you get comfortable, start connecting them. Try to keep the whitespace between them consistent. Circles & ovals. These are made of two strokes: In the first stroke, the opening faces the upper right due to the 45° angle the nib is held at. The second stroke starts where the first one did and curves down to the right to complete the shape. Focus on making the outer edge of the shape into your circle or vertical oval. The shape made by the inner whitespace will be an oval that leans to the left due to the change of width of the line. Squared Circles. Another shape made with two strokes. Instead of making a perfectly curved circle, you want rounded corners at the top, bottom, left and right of this shape. The first stroke starts on the guideline and makes two corners: one on the left side and once touching the bottom guideline. The second stroke completes the shape. The whitespace inside the finished shape will be a rounded rectangle that leans to the left. By now, you may have realized that most of these strokes can be combined in various ways to make letters. So if you are comfortable with the pen and sick of practicing these individual strokes, pick an alphabet out of a calligraphy book, and start to learn it. Remember to take breaks, stretch, and keep hydrated. Pay attention to your posture and body position. It's easy to stress your neck and shoulder. Try to relax and not keep a death grip on the pen. If you have different nib widths, use them. Working larger and smaller changes what you can see and lets you practice different types of pen control. When you practice, both the individual strokes and various scripts, try working at different speeds. Alternate between being slow and precise vs. fast and relaxed. You may learn that certain strokes or scripts flow better at a different speed. You will learn new methods of pen control in the process. Come back to these exercises from time to time to warm up, get used to a new nib, or see how you are improving your control of the pen.